In THEORY, I said – after all, we all know there is no such thing as too many stamps. Not enough room to store your stamps, yes, this is possible. 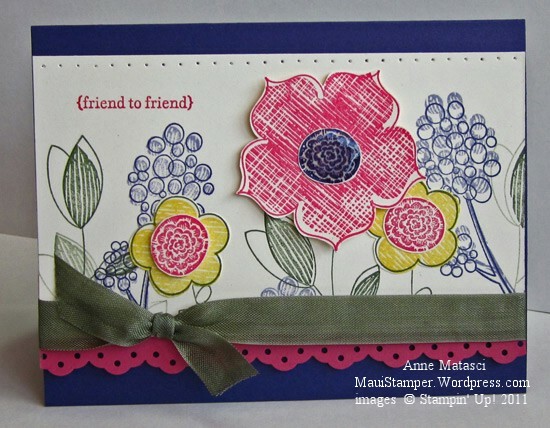 If you look closely and compare today’s card with the previous Raining Flowers card, you’ll see many of the same elements – the Fun Flowers Bigz L die, Crystal Effects, and Two-Step Stampin’ – but these are very different cards. Of course, there are no pancakes in this post, so this card suffers by comparison, but that’s just the way the Ricotta and Mango Stuffed pancake crumbles. I’ve gotta stop thinking about those pancakes.